It started with the toddler dropping her ‘pretty’ down this grate, which is when I noticed a dark hole at the bottom of it. On a hunch I went downstairs, turn the light on and returned to be able to see into the basement. I’ve always thought this was a return vent, but now I’m not too sure. 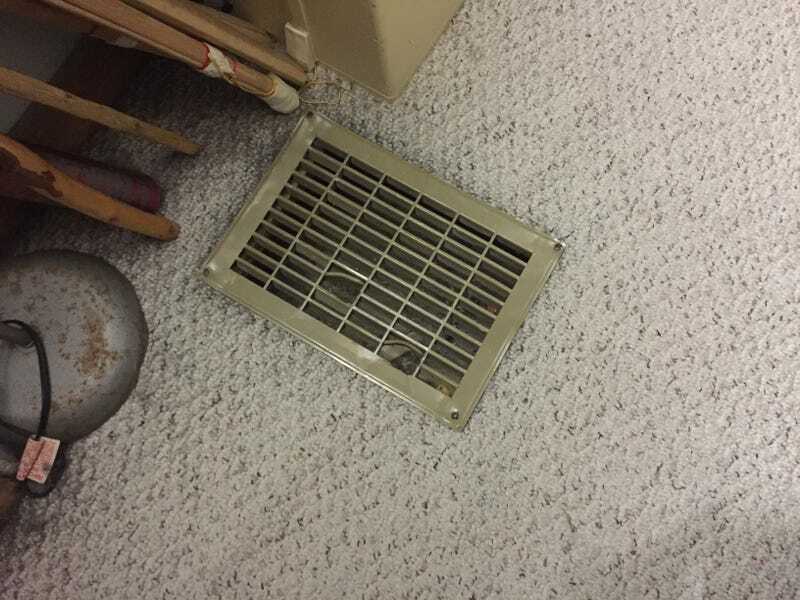 I discovered that the floor for the vent is the ceiling for the basement. You can even see the ‘seam’ of the drywall on the basement ceiling, which pretty much lines up with this not-vent. Actually, I took my phone and stuck it in and took pics. Below is the pic to the right. You can see insulation and a few lines of Romex. To the left you can see the box for the basement light. Now, if this is the return vent, it may be the worst one ever. But I don’t think it is because usually return vents are made of metal. So Oppo, does anyone here have any idea what this is or what it possibly was? Since I’m new to house ownership, I’m baffled.